Irish Cheddar Cheese with Porter Beer is made from pasteurized cow's milk and is considered a vegetarian cheese because a vegetable rennet is used. It goes without saying that a dark beer is an appropriate accompaniment. 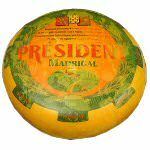 Most of you will know this type of cheddar as 'Cahills Porter'. The blending of cheddar with porter is both striking to the eye and easy on the palate. 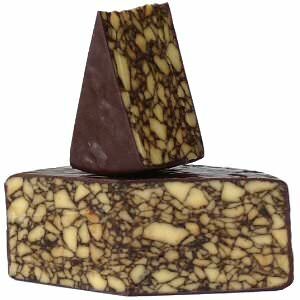 Pebble-size curds are veined with dark-brown porter beer, creating a rich, marbled appearance. The porter does not overwhelm the cheddar; indeed Cahills Porter tastes only slightly beery, with the porter contributing depth and meatiness to the cheese. The fantastic looking gourmet cheese is a full-flavored and tangy cheddar with a firm texture. 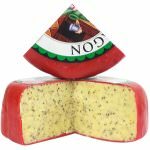 A striking addition to any cheese board, a delight to the eye and and interesting addition to the gourmet cheese lover's palate; certainly one of the more unique gourmet cheeses from Ireland in many years. Just take a look at how this fine gourmet cheese presents itself, and think of the comments it will draw at your next soiree. 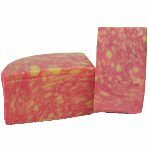 We cut and wrap this cheese in wedge of 8 ounces and 1 pound. Ingredients: Irish cheddar cheese (pasteurized milk, salt, cheese cultures, enzymes), porter concentrate (malted barley, hops extract), porter, caramelized sugar.